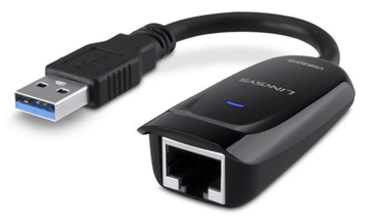 Take advantage of reliable, ultra-fast wired Internet speeds with the USB Ethernet Adapter Gigabit USB 3.0. The adapter offers a USB 3.0 connector on one end and a Gigabit Ethernet port on the other, making it easy to establish a wired Internet connection using your MacBook Air, Chromebook, or Ultrabook. With the adapter's USB 3.0 and Gigabit Ethernet ports, you'll get high-speed data transfers, which is ideal for downloading large files or streaming movies. The adapter is the perfect solution for the business traveler who needs a secure and fast wired Ethernet connection in a hotel or at a conference. Plug the USB3GIG's USB 3.0 connector into your MacBook Air, Chromebook, or Ultrabook and connect the Gigabit Ethernet port to an Ethernet cable and router. 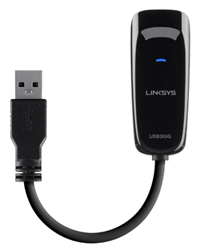 Ideal for travel, the USB3GIG features a slim, flexible design that fits easily in your pocket or laptop case. A travel cap keeps it protected when not in use.